Rings.org.uk has an exclusive view of titanium rings and how they play an important part in many peoples lives, whether married and wearing titanium wedding rings or a titanium signet ring with simple engraving to denote a family or club membership. The first reason you’ll love titanium rings is simple, they are strong like the Greek Gods, the Titans, that they are named after. There’s no arguing that titanium rings are strong. Like titanium bracelets these rings are solid metal that’s hard wearing, capable of taking knocks and corrosion resistant. Titanium rings are a funky alternative to silver rings and stainless steel rings. Keeping the subtle shade of silver grey these rings are sufficiently different from traditional gold rings and are available through Rings.org.uk in many different shapes and sizes. Your wedding rings and engagement rings must be comfortable if you are planning to wear them for the rest of your life. Fortunately titanium combines comfort and style as titanium rings are also non-toxic and are the perfect choice if you or your partner are allergic to other metals. The current trend of matching his and hers rings means that with titanium rings you’re able to add a diamond accent to his wedding ring which matches the fabulous solitaire diamond ring that she wears. Gemstones are readily available so if you’d rather have a ruby, sapphire or emerald it’s possible to add this to your titanium rings at any time. Titanium rings are readily available. Save time and money compared with shopping in town when you search and find your desired rings at Rings.org.uk. Sit back and relax as you browse through many rings until you find the perfect rings for yourself and your partner. 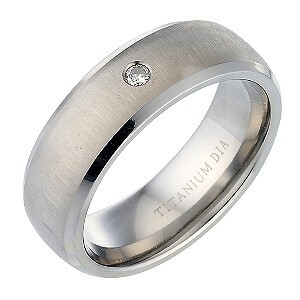 Titanium rings are the excellent choice for mens wedding rings and ladies wedding rings. Choose a matching pair of rings and perhaps have them engraved with a personal message that means so much to you both.